Yesterday was one of my favourite days of the year. The 1st of April, April Fools Day is always a lot of fun. I enjoy watching brands show their creativity in a bid to banter with their audience and try to 'break the internet' as Kim Kardashian once did. This year I've seen quite a few April Fools emails that I really liked. Here's a roundup of some of them which really stood out in my inbox and made me chuckle. A brand with an abundance of beautiful products and personality to boot. 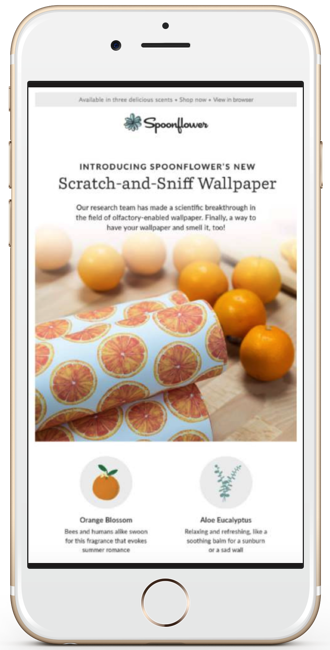 This April Fools email introducing their new Scratch-and-Sniff Wallpaper was a winner in my eyes. Funny, clever and on brand. This April Fools Day, Build-A-Bear became Build-A-Bae when they decided to throw their hat into the dating game. 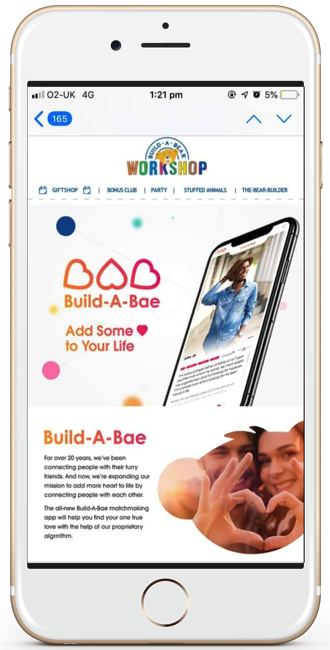 Promising to expand their mission from connecting people with their furry friends to connecting people to each other, Build-A-Bae was the hottest matchmaking app. For one day only. Next up, we're off to the glamorous world of makeup. 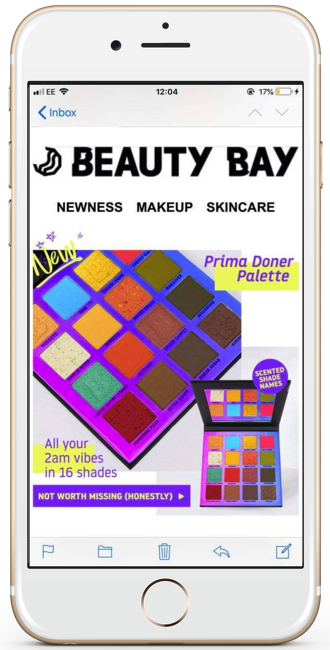 Beauty Bay's April Fools email introduced their Prima Doner (as in kebab) Palette which had all the 2am vibes in 16 shades. Shades included: Nuggets, Cheesy Chips, Pepperoni Pizza, and our personal favourite... Jagerbomb. Makeup with a side of gravy. Classy! Now to being up at 2am for a different reason! 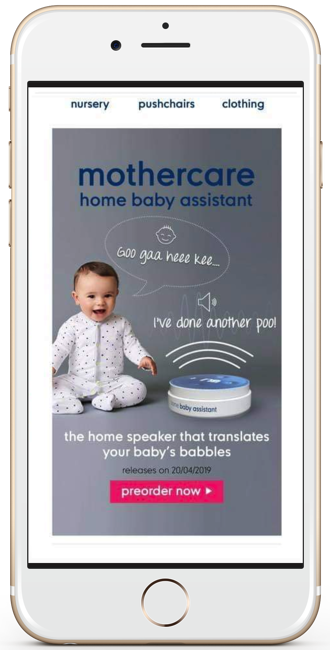 This cheeky email from Mothercare raised a few smiles when they offered a 'home speaker that translates your baby's babbles'. The ultimate home/baby assistant. I wonder how many pre-orders they clocked up! Now anybody that's ever turned to fake tan in an attempt to be a bronzed god/goddess will understand the hilarity in this email. Fake tan that promises the world. 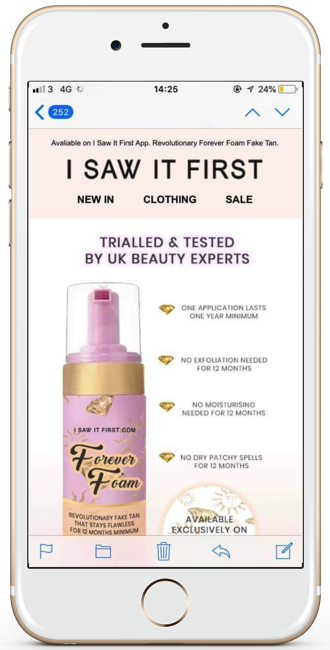 Application lasts one whole year, no exfoliation or moisturising required and a flawless tan. Sadly, I knew this one was wayyyyy to good to be true. 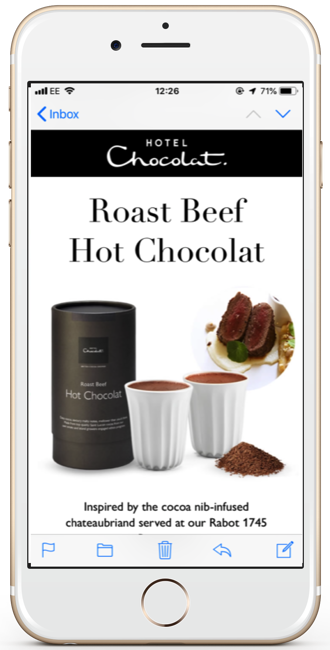 Who wouldn't fancy a hot chocolate enriched with the flavour of 24-hour marinated braised beef? Whilst it may be 'meltingly full of flavour' it certainly raised a few questions marks with us. Until we remembered the date! As a brand specialising in gear to 'help everyone get outside' we loved this pet-themed adventure email. The ethos of the brand, paired with the photography and story make this a heart-warming, smile a minute April Fools email. The CTAs are super cute too! Check out their site for the whole story behind adventures for pets. We hope you've enjoyed this April Fools roundup - if you spotted any others you think we should add, get in touch!